Last updated 13 November 2018 . By Faith Strickland. Sunday roasts at South Place Chop House come with unlimited wine. In the mind of any British person, Sunday roasts are synonymous with comfort, whether it be mopping up the remnants of your soul after a Saturday night out, or drowning out the sound of your dad’s ramblings about what exactly you’re doing with your life. So when it took me two trains, two replacement buses, and three hours of travelling to get back to London after leaving it for less than 24 hours, I was in need of mum-hug levels of comfort; step up South Place Chop House. Not far from Moorgate, the City spot was still busy when I rocked up an hour late, with a mix of couples, families, and a table of very smart and very beautiful women, celebrating a birthday. Set on the bottom floor of South Place Hotel, the chop house feels a thousand miles away from a soulless hotel bar, and while it’s the antithesis of a traditional pub, the modern room still feels cosy with floor-to-ceiling windows, an open kitchen, and bronze-gold colour scheme warming everything. 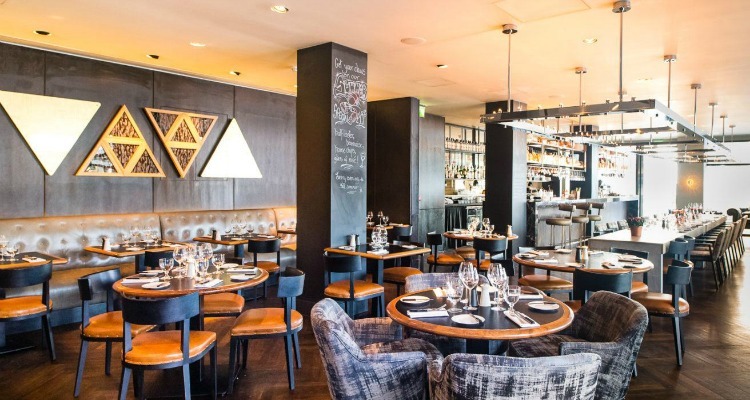 Stylish with industrial leanings, South Place Chop House is a great option for a special occasion. In a city that serves up at least 5000 roast dinners* every Sunday (* a completely fabricated guess), it’s hard to stand out. But South Place Chop House have found a way to push their tatties to the top of the pile: bottomless wine. We started with a fist-sized fish cake (£9) of a light mix of cod and smoked haddock before tucking into slightly pink slices of roasted sirloin (£20), which came with a side of perfectly fluffy duck roasted potatoes. Pudding is an equally as British affair, with an apple and blackberry crumble (£7) that’s substituted the usual flower and butter topping, for crunchy oats. It could have been the post train-travel stress or the Saturday-night hangover, but it was more likely the unlimited wine, great company and effortless service that kept us in South Place Chop House for well over three hours. While it’s hard to do anything too revolutionary with a Sunday roast, this smart offering is a delicious tribute to the classic British meal, with bottomless wine turning it into a fun option for an occasion. Next time I’m stuck on a train, I hope it’s with this place waiting on the other end of the line. 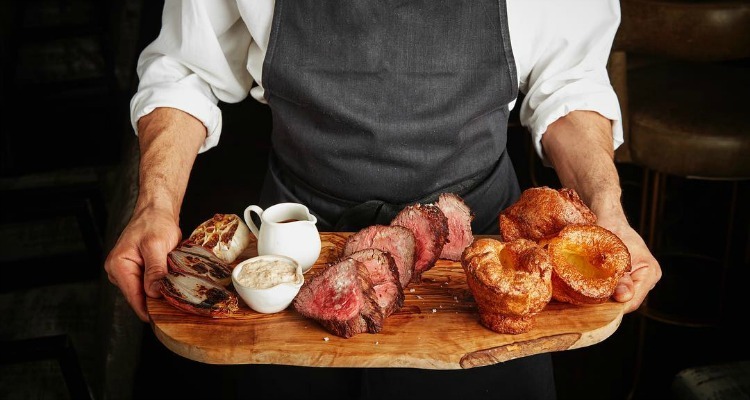 Sunday Roast is served at South Place Chop House, 3 South Place, London EC2M 3AF, from 12pm - 5pm. Unlimited white or red wine costs £15 and must be ordered with at least two courses from the lunch menu.